The only spacial habitat that's cylindrical in nature is the hypothetical O'Neill Cylinder, which as a term you seem to be downright allergic to. 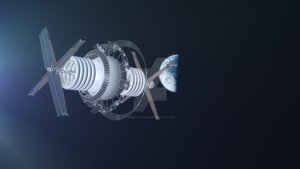 Nope, the McKendree Cylinders is a real idea as well, the main difference between it and an O'Neill Cylinder is the size, so since this concept had to be big to wrap around the planet, decided to use the McKendree instead of the O'Neil. Admittedly went and did some light research to find out my rightness/wrongness on this; apologies for the egregious idiocy on my part. It's fine, there's a lot of research out there, and a lot of theories, and a lot of differing opinions on how feisable this stuff is. I do my best to do my net research, but I am not a scientist, and won't get everything correct either. I'm familiar with O'Neil's because they're the one most physicists and structural engineers will nod along in agreement to. Is it just me, or do you hate Oneil Cylinders? I love them, I mean hey, they're a Neil like myself it's actually quite the opposite, I want the painting for that one to be extra special, so I have a half finished one that I hope to finish at some point with extra detail and awesomeness. Are you planning on doing shell worlds as well? Exciting! I forget, have you done space fountains? Not really on the same level as rungworlds or niven rings, but they're one of my personal favorites. 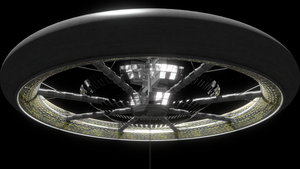 Space fountains may be discussed when I do the "Orbital Ring", which runs on a similar concept. Made me want to install some good 4x games I have not played insome time. Wow, its incredible epic and fascinating! I would love to see this image in full size. Typically those megastructure concept are supposed to be built around a physic constant or a known orbital mechanic, with the idea that Physics explain and justify their shape and size. Like how a Ringworld is shaped, sized and rotating because centripetal force require it (but doesn't HAVE to be scaled around a star, only to be ring shaped). However this "rungworld" -as you say it- have no particular reason to have this size. I'll still have to check for the impact of TIDAL FORCE on such a structure. I fear it might slow the rotation of the colonies but I could be wrong on that. If I'm getting your picture right, spaceship would definitely NEVER enter a spinning colony by a hole in the rotating parts, and (if that's what you hope for) centripetal force won't keep the air in, quite the opposite. Also the whole point of linking together several O'neil colonies together is to share the same "static part" which would contain any trading (without using any spaceship) and still host any needed spaceship dock (since it's static). In any case, that's not on any list of megastructure concept I know, or rather, it's 2 of them scaled up beyond reasons + what look like a critical error. For the interior of the cylinder, I had some discussion with people about the amount of atmosphere that would be required to fill the volume. Since it's made of McKendree cylinders, you'd have approx 1000km of atmosphere between a person standing on either surface, which is approx 10x the height of our atmosphere on earth. That led to discussing that a better idea might be something like what was discussed in the book "Bowl Of Heaven" by Larry Niven, a thin membrane over the ground surface that was used to keep the air within a 100km radius of the ground. That thinking led me to decide you could potentially bring space ships into the interior, which is why I made that sketch. Your point about using the ring portion to transport goods (possibly in a train) is a fair one, but in the case of a rungworld that's not surrounding a planet, a more direct route to your furthest neighbors would likely still be a spaceship from my understanding. I appreciate that you are very focused on the physics, and when these illustrations end up in book form (the text itself will be written by an actual profession astrophysicist), expect a lot of discussion about how it could work, some of the challenges of making it work, even some of the reasons why it may never work (I had a guy tell me that an Alderson disk violates all the laws of physics for example, so we will include the illustration, discuss how it is supposed to work, but also discuss why it may never work). I am sorry that my illustrations do not meet your standards of accuracy, if you really don't like them, it may be best to stop following my work. I wish you the very best in life and all of your own endeavours! It's not so much about the scale and "accuracy" (even if I mentioned it) than small details contradicting the concept and text going with it. Getting both the Text and the Arts working together can give a fabulous sense of awe, this is why I'm offering you my opinions (thought you might not been asked for vulgarization but for your own artistic choices). Anyway, you've deviated from McKendree cylinders and added ideas that work against the concept of a Rungworld (regardless of the size, the scale is secondary concern). The difference between an electromagnetically accelerated (and decelerated) spaceship and a train is only a matter of it following a predefined trajectory and not needing course change. In any case, spaceship are ok. You need them for many other uses, my point is only about where you park them and how you save propellant for shorter range travel. Ps: about the Alderson disk, it's indeed not technically feasible outside of fictional material (and have no practical use). Honestly I would indeed never bother calling anything a "Megastructure" if it didn't have the slightest possibility/reasons to exist. The Ringworld can exist on smaller scale (even before becoming a Torus) and the Rungworld is just several O'neil/Mckendree cylinders linked together. The spinny bit is nested inside the greater cylinder you know like your washing machine. Check out Isaac Arthur on youtube or The Orionsarm website they explain it in greater detail. At the risk of sounding presumptuous I don't need to be explained "that much", it is definitely wrong to show the living area leading directly to space on the bottom right. This is not what you are describing: a static (and aesthetic) outer casing around the spinning cylinder habitable area. I know both OA and Isaac Arthur. Orionsarm is not a very good example of realism, its raison d'être being to use the Science-Fiction tropes first, making them credible second. For example the rung-like design itself don't have a specific reason, it is just the consequences of several O'Neil closed-type colony linked to each other. and scaled up to make it impressive. Putting a static part around a O'neil type is useful "radiation shielding" as this mass doesn't need to rotate, but putting a space dock between said shield and the spinning habitat is only calling for trouble (Space dock outside the docks however would be the occasion for a very cool static-to-rotating train transport system). Cool idea. It seems like it might work. 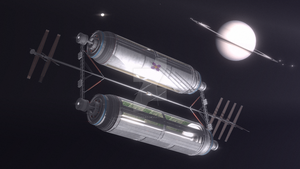 Thats interesting idea, and the best part, it migth acualy be how future space colonies look like! I'm a simple man. i see ring world pun, i click. To think of something this gigantic is scary. I've only heard about a few megastructure theories from likes of Asimov, but that Rungworld is very intriguing. Makes you wonder how long and how much it would cost to park one of those puppies in orbit around a gas giant or star? wow, each of those rungs would be around the size of Planet Earth! ahh well still massive. I guess I sorta overestimated the size of the gas giant. I would have thought that the gravitational constant on any specific part of the planet below it would be effected while the ring was being constructed. You would see seismic disturbances, changes in atmospheric density and other environmental anomalies as the body of the ring was assembled. Although these issues would not be considered dangerous on a gas giant or say a rocky world that was to be the focus of mining operations, such instances may well cause considerable damage to an inhabited one. In addition the formation of the structure would act to block out the light from the nearest primary star for extended periods or permanently depending on what sort of orbit the ring actually has. In the case of gas giants, I suspect the gaseous mass would be pulled upwards by the gravity shadow of the ring. I've never heard of this type of structure before! Did you come up with it? Fleets of ships...or a really good train track. There was some discussion of this on my facebook page. I think it depends on which neighbors you're trading with. If there's no planet in the middle, and you want to trade with the rung 180 degrees from you, spaceship transport might be faster than transporting stuff through the ring portion. But you're right, for near neighbors, the ring might be the best bet. In the space colony proposals of the 1970s, low gravity rings like the ones here were classically the location of your zero-g farming. So I always assumed they would fulfill that function, with each nation state "renting" some portion of the ring to produce their food. But they could certainly have transport in there as well. Lol! I just imagined the whole thing collapsing into the plant! oops, I didn't even realize I replied to your comment on my phone. It was meant for OP. Glad you like it. Nope, that structure has been discussed in a couple of places, such as Orions Arm and the Isaac Arthur youtube channel. Your welcome, and oh ok.